Swim and dive split their dual meet against rival Kentucky at Ralph Wright Natatorium. The No. 14 men won their 10th straight meet over the Wildcats (168.5-131.5) while the No. 10 women dropped their first meet to UK in nine years (161-139). A tight meet for both teams throughout, coach Arthur Albiero said it’s a new position for so much of his team. “We’re young in so many ways so that’s the challenge for some of our young kids in that situation. We’ve got a little bit of work to do,” Albiero said. Albiero said his team should be prepared for the quickly arriving ACC tournament, but they still need to take care of business now. “This is going to be our deepest team going to the ACC championships, but in a dual meet it’s about having power in the front (of the meet). We left a few things for chance,” Albiero said. Both teams trailed through the opening six events, but stayed close to Kentucky. Both men and women took the lead before the first intermission, as the women swept the 50 free and the men took first and second. Sophomore Casey Fanz won for the women and sophomore Andrej Barna won for the men. From there, the men and women handled their lead differently. On the women’s side, the Cats clawed back into the match with back-to-back wins in the 200 back and 200 breast to put them in striking distance. UK took the lead back by taking first and third place in the 500 free. Kentucky’s Asia Seidt took first place in the 100 fly and 200 medley. Needing a sweep in the 400 free relay to take the win, Louisville took a first and third place. But after official review, Louisville’s winning team was disqualified due to an early take off, giving the Wildcats first and third place and ending the chances for U of L.
Albiero said he thought his women were prime for the comeback after losing the lead. 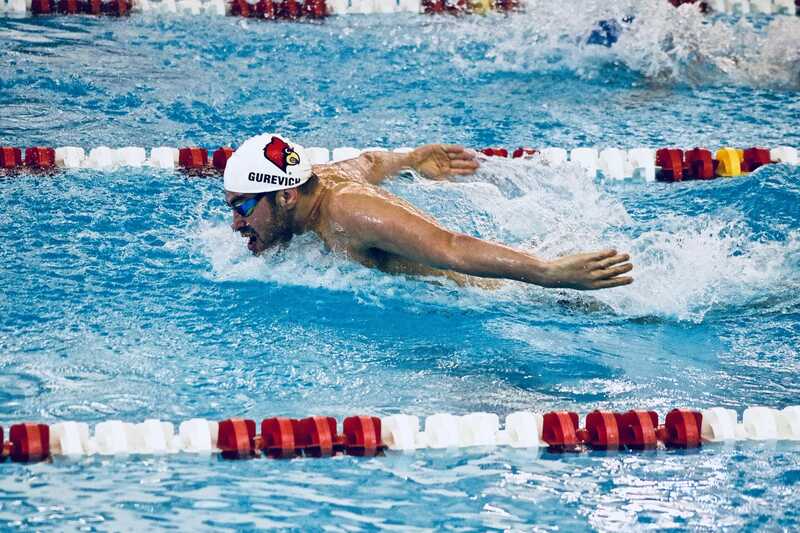 On the men’s side after gaining the lead in the 50 free, U of L won three straight events, as well as taking two of the three top spots in each. To keep their distance, Louisville won four of the last five events to keep the Cats at bay. Albiero calls the tight meet a learning opportunity for his young team. Louisville hosts Indiana on Friday, Jan. 26 for their senior day.